A super card Pat, a fabulous image and lovely soft colours. Gorgeous card Pat, fabulous image & design. Very nice card and cute image!!! A really lovely creation Pat and I can see at least two more 'B's - brown and bow, it's perfect for our 'I spy' theme at Allsorts this week, many thanks for joining in. This is so beautiful. I love the soft colors, and elegance of your card. Thank you for joining our challenge at The Paper Shelter. We hope to see you again! Best of luck to you. 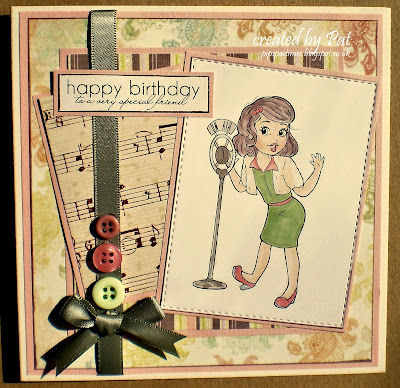 Great card - love the layout you've used. Thanks for joining us at a Gem of a Challenge - hope you'll be back for our new challenge tomorrow.